You know broad match brings you additional traffic. However, you at times question the relevance of broad match, particularly when compared to other popular match types. Just like beauty, ad relevance is in the eye of the beholder. 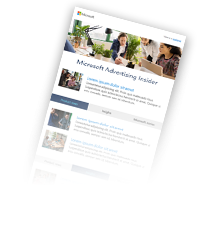 In search advertising, our searcher’s interpretation of relevance can vary drastically based on their unique personas, preferences and trends. In the past 12 months, we’ve worked hard to improve our broad match technology to give you quality and control, in addition to more volume. Just recently, we have improved our matching technology of brand, people, geography and product intent. In addition, we continue to invest heavily in click prediction, quality protection and conversion quality so you can relax and let us do the heavy lifting. If you still have doubt about broad match, you have several choices to control the matching. Use it in combination with exact negative match, phrase negative match and/or broad match modifier. You’re in control. 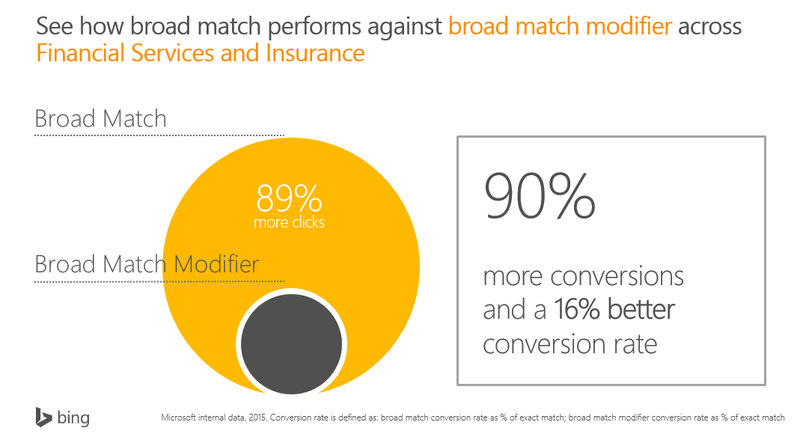 Do you know that broad match could bring you 72%1 more clicks and 45%2 more conversions than exact match? Now, that’s a sweet proposition! Don’t take our words for it, see for yourself. Some of you may simply use broad match modifier alone for two reasons. One, it gives you slightly more traffic than exact match. Secondly, it has a better conversation rate than that of broad match. Is that a good strategy? Let’s find out. 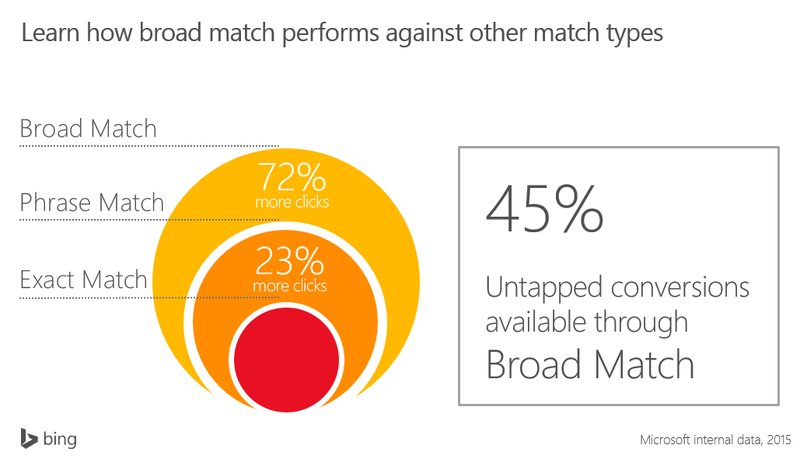 Broad match modifier or broad match - it depends! Our study shows that, depending on your goal and the nature of your industry, you could benefit from the higher conversion rate of broad match modifier, like in the Retail industry. However, you do leave additional clicks and conversions on the table when using it alone. Broad match brings 87%3 more clicks and 85%4more conversions to most industries! Now that is something you do not want to miss. As an added bonus, broad match converts better than broad match modifier in certain industries, such as Financial Services and Travel. For more information about the performance by top industries between broad match modifier and broad match, check out our research by industry here. At the end of the day, we want you to weigh in on all the options available to you and make an informed decision based on performance data. We’re here to help!